Hello everyone, and welcome to Tiggerific Tuesday Trivia — the weekly trivia segment that brings together all the best Disney trivia for you to enjoy! I’m joined by my friends Jodi from Magical Mouse Schoolhouse, Heidi from Heidi’s Head, and Jenn from Disney Babies Blog — and you, if you join in our group! It is reported that the Disney Dream is headed home! 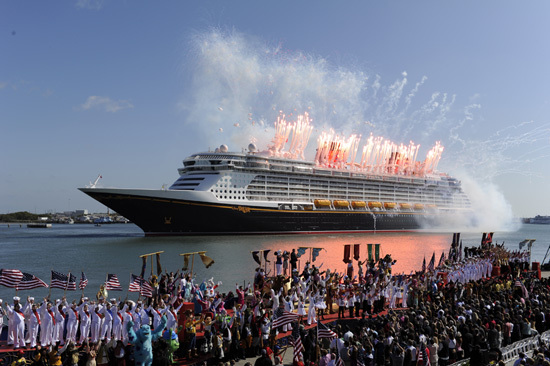 After nearly two years of construction, Meyer Werft, the ship’s builder, officially hands over the massive vessel to Disney in a traditional maritime ceremony aboard the ship in Bremerhaven, Germany. The Meyer Werft flag is lowered, and the Disney and Bahamian flags are raised, signifying the transfer’s completion. Plans have the ship departing Bremerhaven for its transatlantic voyage to Port Canaveral on December 19 (and arriving in Florida, USA on January 4). Thank you for stopping by today as we take a look at the start of the Disney Dream! Now, please go check out the rest of the entries below, and thanks for stopping by!